I'm sure you'll agree with me when I say that heavy-metal music and religion have been very strange bedfellows in the past -- due to the fact that these two diametrically opposed entities literally balance each other out. However, could you imagine what it would be like if there was a comic book to amalgamate these two components together? My mate Grigoris can. Here, check out an interview I had with him just the other day, whilst we were watching the film 'Sister Act' within the pits of Hades. 1) What are your own origins Grigoris? And when did you know that you wanted to be a writer? My brother and I wrote comics as kids and later I put out an underground comic in high school and at college with friends. So I knew I enjoyed writing from an early age. 2) What inspired you to create the comic ‘Satanic Hell’? The idea for Satanic Hell was inspired by a friend of mine from high school. He came from an Assembly of God household where metal music, fantasy books like 'Lord of the Rings', and role-playing games like 'Dungeons and Dragons' were forbidden because they were “works of the devil”. I came up with the name of the band back then as a humorous reaction to this bizarre Christian fanaticism against all things “Satanic”. At the time there was a real attempt to crackdown on alternative culture - the PMRC, the trial against Judas Priest accusing them of back-masking suicidal messages, and lots of ridiculous PR against “Satanism” in metal music. Unfortunately the Christian Right’s political influence has only grown since then and the story reflects this. 3) In your own words, how would you describe this comic book? Plus what formats does it come in? 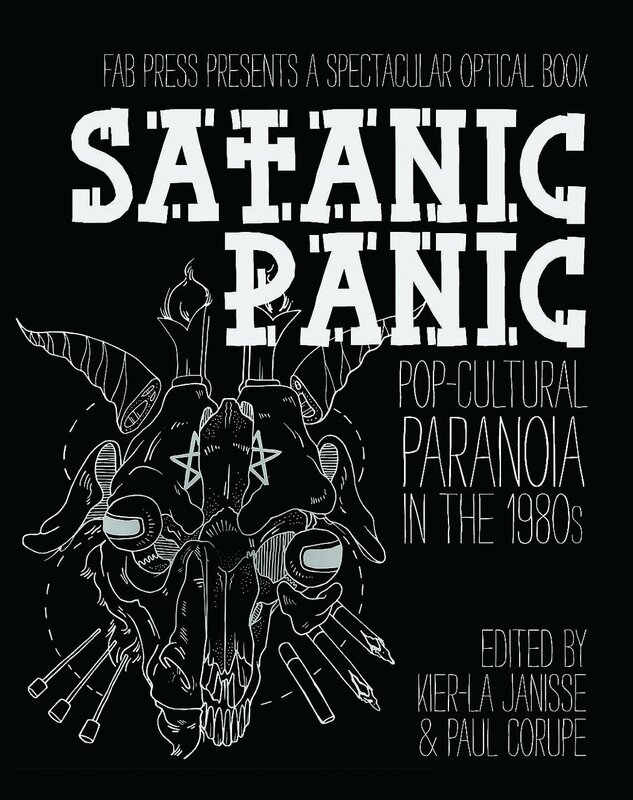 Its a satirical story about the industrial metal band 'Satanic Hell' and their journey into Texas, which is controlled by a council of religious fanatics. My brother, the editor of the series, described it as “Marilyn Manson meets Star Wars” (referring to its epic nature, not aliens). The band is trying to find a future for their flailing group in LA when they get a call to do a tour in Texas from an unknown promoter named Sam. As they venture deeper into the heart of Texas, tension between the band and the Texas Council of Churches rises. The three band members go through their own internal problems as the pressure builds. Death Priest, Dante, and Exodus, have to figure out what they want for their future as the band faces off with the Council. 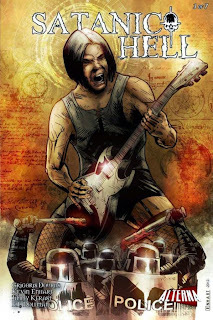 Fans of dystopian fiction, science fiction, metal, rock, or punk will enjoy the story. 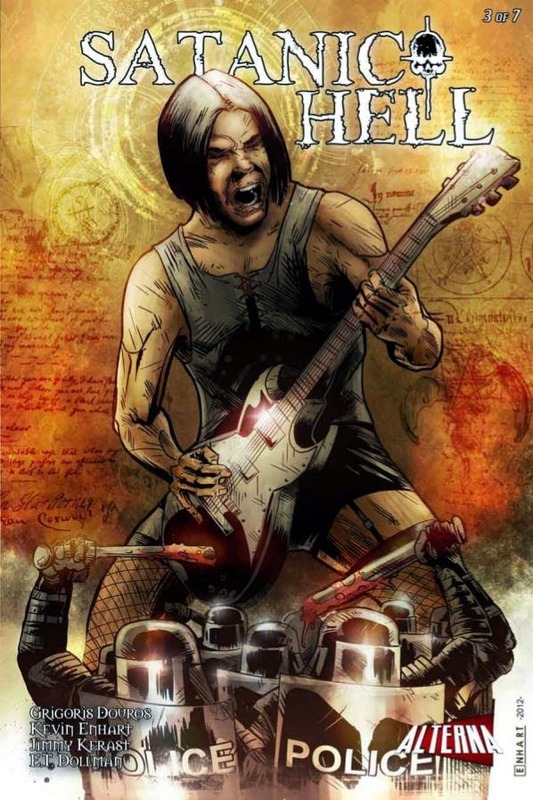 Satanic Hell is a seven issue digital series with an issue coming out every six weeks for $0.99 each. The first issue arrives June 23, 2012, and can be found on: Kindle, Nook, Kobo, Apple, Android devices; on Facebook and the web through Graphicly; and in PDF or CBZ formats on DriveThruComics. Readers can find the comic for purchase through the Satanic Hell website or directly from each platform. 4) How did you guy’s meet up, and what have you learnt about each other from working within this collaboration? I met Kevin Enhart, the artist on the series, on DeviantArt, and he immediately saw the story as unique and understood the vision. Kevin had worked on other comics like 'The Heindrich Project' and 'Returned'. He sent me some killer pics he did of the band and we joined forces. Kevin recommended Jimmy Kerast for the colors, whose portfolio was impressive. Jimmy’s colors on the first issue have gotten a great reaction. My brother Chris is the editor and was a natural choice. Jimmy and Kevin live in France, so we collaborate online. It still amazes me how the internet and digital distribution has made it so much easier for independent creators to collaborate and publish. 5) What was the first comic book you ever read? And do you still read mainstream comics? My grandmother regularly bought superhero comics for my brother and me starting in the first grade. I still have Todd McFarlane’s first Spiderman story where she wrote my name all over it. The first comic book I bought was X-Factor #1 and a Fantastic Four. Now I love the digital option for comics - they don’t take up space and you can buy and read them anywhere. I don’t read many superhero comics anymore, as I prefer to explore indie and alternative comics. Currently I’m reading 'Axe Cop'. 6) During your time as an writer, what is the one thing that has kept you in good stead? My pet snail Climber. He’s a constant source of encouragement. Thanks for that, Grigoris, much appreciated pal. So when you have the time dear reader, please feel free to click on satanichell.com, plus don't forget to do the facebook and twitter thing either. Good reader you. You may now have a biscuit.